Don’t you just love it when you see a recipe that you want to make and then you realize you have all of the ingredients on hand? Me too! I do a little happy dance. Because otherwise I either (a) run out to the store to get the ingredients (not the best use of time), (b) file the recipe in my recipe folder, or (c) put the recipe in my handy dandy organizer and plan to make it in an upcoming week. 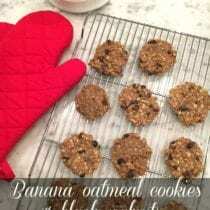 Nope, with this recipe for Banana Oatmeal Cookies you can skip right to (d) and MAKE IT NOW! Because aside from black walnuts, I’m pretty sure you’ll have everything on hand. So let’s talk about those black walnuts. 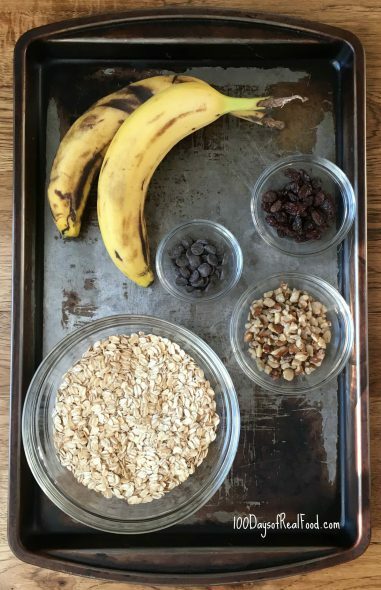 Lisa created a recipe for cereal bars that our partner Hammons sponsored recently, and we’re excited to bring you another recipe today. This was my first introduction to black walnuts, and I was interested in some of the benefits that they offer. Black walnuts are bolder and earthier – yes, earthier definitely describes them. Nutritionally speaking, they deliver more protein than any other tree nut and also offer fiber and omega-3s. They are typically used in baked goods, lending themselves well to savory dishes, or as a crunchy topping on yogurt, oatmeal, salads, etc. You can find black walnuts at many stores or purchase them directly from Hammons. So grab a bag when you are out at the store so that they become a regular staple and you can skip right to (d) as mentioned above :). 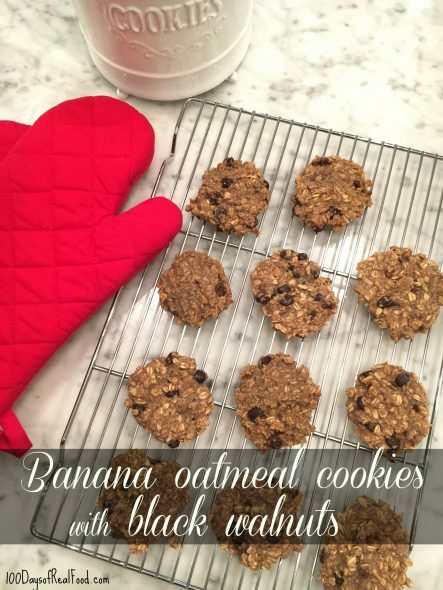 These Banana Oatmeal Cookies would be great as an after-school snack, a throw-in for the lunchbox, or even doubled up for a different on-the-go breakfast. Why not?! Let me know if you try these and what you think:). Preheat to 350° F and line a cookie sheet with parchment paper. In a high speed blender (or food processor), puree bananas, melted butter, and maple syrup. In a medium mixing bowl, place the oat flour, rolled oats, baking soda, and cinnamon. Stir to combine. Add wet mixture from blender and mix. Fold in walnuts, raisins and chocolate chips. Scoop onto the prepared cookie sheet and flatten. Bake 13 - 15 minutes. Cool and enjoy. The Only Oatmeal Cookies I've Ever Liked! Can you use whole wheat flour instead of oat flour? I was about 1/4 cup short of oat flour and used whole wheat flour for that last bit instead. They turned out wonderful! Thanks for this great simple recipe. I used 1/4 tsp of salt and 3/4 c of walnuts and choc chips combined (we don’t have raisin lovers:). Just the right amount of sweetness! And love having a homemade cookie that I feel good about giving to my kids. For the oat flour – can we just blend oats into a powder? Yes you can. I use my high speed blender to do this. Hope you enjoy them! That’s how I make my oat flour. I use a coffee grinder which has never been used for coffee . Going to try with coconut oil instead of butter…these look great! Excellent! So much better and so little sugar. I didn’t have oat flour but used a combo of whole wheat and white flour, used applesauce instead of butter as I can’t have it, and they turned out just fine. Any way to know the carb count as I am diabetic. Thanks for a good recipe. OMG, These are such pretty cookies! I just printed off the recipe! Thanks for sharing! I will be making it for my kids!!! We followed all other directions except I blended the wet ingredients by hand. They turned out delicious & my toddler certainly approved!